After two years of community outreach and critical study to evaluate and prioritize projects into a fiscally responsible Long-Range Facilities Plan, the Battle Ground School Board voted to place a bond measure on the April 24, 2018 ballot. The board decided to put the bond before voters a second time after it received 58.68 percent of the vote, failing to reach the 60 percent supermajority required to pass in the February Special Election. A team of dedicated volunteers from every area of the district met weekly to prioritize projects in a Long-Range Facilities Plan based on community input from residents like you. They studied the age and condition of each building and considered when each becomes eligible for state matching funds. This bond is Phase I of the three-phased facilities plan. Several of our schools are 40 to 60 years old and have been rated “poor” for structural integrity and functionality. Construction experts have determined it will cost as much to renovate these buildings as it will to replace them. Students will benefit from safe and modern learning environments, and the district will benefit from cost-saving energy efficiencies. In newer schools, facilities improvements are needed to preserve your investment in schools. 2. Address overcrowding and keep class sizes small. The district has taken steps to handle growth in the southern part of the district, including revoking boundary exceptions at four schools and adding portables. At Glenwood Heights Primary and Laurin Middle, 42 percent of the classrooms are in portable buildings. In addition to growth, the district needs additional classroom space to keep class sizes small per state requirements. All schools in the district need improvements in door locks, controlled entrances, and additional cameras to keep our students and staff safe. 4. Update classrooms to meet learning needs. Schools need technology and classroom improvements to provide skills in the areas of STEM (science, technology, engineering and math) and career and technical education so graduates can be college- and career-ready. The total schools tax rate in 2019 will decrease, even with the new bond. Projects were selected to maximize up to $61.6 million in state matching construction funds. The district will be able to take advantage of historically low interest rates. Architectural designs for new schools will begin with Battle Ground’s prototypical school design to help save costs. The local cost of the bond is $224.9 million after up to $61.6 million in state matching assistance. Even with the bond, the total schools tax rate (per $1,000 of assessed value) is projected to go down $1.35 in 2019 (when bond collection begins). More information about school tax rates is available on our Budget webpage. 2018 is a “transition year.” Tax rates temporarily increased for one year. The increase is due to sweeping changes made by the State Legislature for school funding (see chart). The bottom line: The total schools tax rate in 2019 is expected to be less than the two previous years, even with the new bond. If the bond passes, the district will receive an anticipated $61.6 million from the state to help fund the construction projects. Schools are eligible to receive state matching funds for replacement or renovation just once every 30 years. One of the factors used to select which projects would be included in the bond is whether the projects are eligible to receive state dollars, thereby reducing the impact to local taxpayers. Districts can build schools of any size, but only receive state funding assistance for 90 square feet per K-6 student, 117 square feet per 7-8 student, and 130 square feet per 9-12 student. 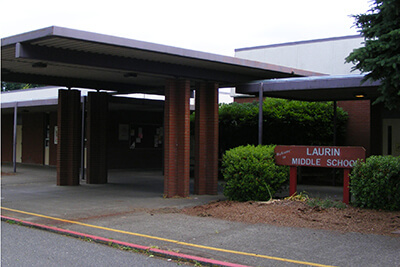 At Laurin Middle and Glenwood Heights Primary, 42 percent of the classrooms are in portables that are at least two decades old. The bond measure, if approved, would reduce the number of portables, giving students space that is safe, secure, and energy efficient. As good stewards of taxpayer funds, Battle Ground consulted with construction experts to determine the best course for each project. The experts assessed the buildings and recommended replacing Glenwood Heights Primary, Laurin Middle and Pleasant Valley and the 500-900 buildings at Prairie High School. Remodeling can cost the same as replacing and does not provide as many safety, security, and technology improvements or energy-saving efficencies. In addition, projects that use state funds are not eligible for state funds for another 30 years. Battle Ground Public Schools is not currently eligible to receive state matching funds for a new high school based on enrollment. 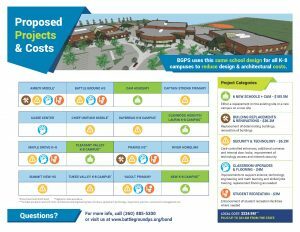 The Facilities Improvement Team will explore a third high school in the planning process for Phase II of the district’s Long-Range Facilities Plan; however, no decisions have been made about what the high school will look like or where it might be built. Based on age, Prairie High School’s 500-900 buildings are eligible for state match now, and the rest of the campus will be eligible in 2025. Battle Ground High School will be eligible for state match based on age in 2026. 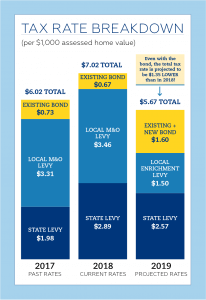 Simply put, bonds are for building and levies are for learning. 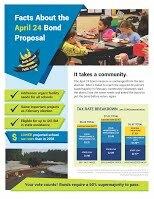 Bonds pay for construction of schools and facilities and capital improvements. Levies pay for costs associated with learning, such as teaching and services provided by specialists, coaches, health professionals and counselors, and materials such as curricula. Levies also help fund transportation, maintenance, extra-curricular activities, educational technology tools, and communications and safety and security services. 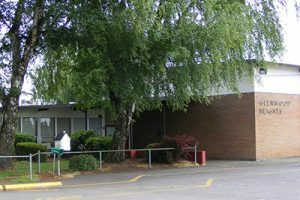 The last Battle Ground schools construction bond passed in 2005. That bond will be paid off in 2023. It funded the construction of Daybreak and Tukes Valley primary and middle schools, Chief Umtuch Middle School, Amboy Middle School, the construction of additional classrooms at Captain Strong Primary, the construction of the Laurin Middle School commons, the conversion of Battle Ground High’s cafeteria into a stage/auditorium/cafeteria, the refurbishment of Prairie High’s track and auditorium and replacement of roofs, as well as technology and safety upgrades across the district. Glenwood Heights Primary, built in 1956 for 484 students, is overcrowded with more than 800 students. The building is energy inefficient and rated “poor” by construction experts. It lacks secure access to classrooms and doesn’t have the modern infrastructure to support today’s learning styles and technology usage. The core facilities, such as the parking lot and cafeteria, are too small to support the number of students. Fourth graders eat at the nearby Laurin cafeteria. The school will be replaced with larger facilities based on the district’s prototypical school design. Laurin Middle School was built in 1965 for 600 students and has more than 700. The facility shows the wear and tear of its 52 years: sagging breezeways, leaky roof, deteriorating facade, poor drainage. Built based on a “California” design, the school lacks secure access and modern safety and security features. The school will be replaced with larger facilities based on the district’s prototypical school design. Pleasant Valley Primary and Middle, built in 1975, are over capacity. The schools do not have a cafeteria; students eat in their classrooms. Students in portables carry their hot lunch tray from the main building, across the campus even on rainy days, to their portable classroom to eat. Library books and a checkout desk line the main hallways. The schools do not have a separate library. The buildings are showing their age with leaky roofs and increasing maintenance costs. The schools will be replaced with larger facilities. To help accommodate growth, a new K-4, 5-8 campus will be built west of NE 152nd Avenue between NE 99th and 119th streets in the southeast corner of the district. The schools will be based on the district’s prototypical school design to help save design and construction costs. The bond will replace the 500 to 900 buildings (all rated poor) at Prairie high School and renovate the 300 building and gymnasium at Amboy Middle School. The bond will also fund the development of an Alternative Learning Experience site for CAM Academy, which is currently located in a building that the district leases at an annual cost of $500,000. The bond will improve security and safety in all schools with internal classroom door locks and additional security cameras. Schools will be improved with card-controlled entrances. Perimeter fencing will be installed at Prairie High School. The bond will fund the modernization of middle school spaces at Amboy Middle and Maple Grove School for the teaching of science, technology, engineering and math. Classrooms at Prairie also will be modernized for skilled jobs training. The flooring will be replaced at Battle Ground and Prairie high schools, Maple Grove, Yacolt and district office. The flooring in some of these locations is as many as 40 years old. The bond will fund the construction of covered play areas at Maple Grove, Yacolt Primary and Amboy Middle schools. The bond will be used to replace the turf and upgrade seating at District Stadium and provide covered bleachers at Prairie High School. Read more about the bond on the BGPS News Blog. One of the goals in Battle Ground Public Schools Strategic Plan is to provide safe and secure facilities that are equipped to prepare our students for college and careers and accommodate a growing student population. With that goal as the guiding principle, a community-led team of dedicated volunteers from every area of the district worked for two years – often meeting weekly – to craft the Long-Range Facilities Plan, which charts a course for providing appropriate facilities for educational instruction now and into the future. The Facilities Improvement Team (FIT) presented their plan to the Board of Directors in the spring of 2016, along with the recommendation to run a bond measure that would fund Phase I of the plan. The board passed a resolution to put a bond before voters on the November 8, 2016 general election ballot. The bond failed to get the supermajority it needed to pass. Enhance schools for 21st century learning. Voters last approved a school bond in 2005* at a rate of $1.26 per $1,000. This bond will be paid off in 2023. *The 2005 bond paid for Daybreak Primary and Middle, Tukes Valley Primary and Middle, Chief Umtuch Middle, Amboy Middle, Captain Strong classroom expansion, Technology and safety upgrades, Laurin commons, Refurbished PHS track and auditorium and replaced roofs, Converted BGHS cafeteria into stage/cafeteria.